Subject: This fine-grained rock was rafted to this location during catastrophic floods that occurred during the end of the Ice Age. The 90-ton glacial erratic rock at the top of this 1/4 mile-long trail is a stranger from a distant location- it was transported here thousands of years ago on an iceberg in the wake of a cataclysmic flood. During the last Ice Age, 13,000-15,500 years ago, a giant glacier dammed the Clark Fork River in what is today southwest Montana and created a huge lake- Glacial Lake Missoula. At 3,000 square miles, the lake held nearly 500 cubic miles of water. Rising waters collapsed the ice dam several times, releasing tremendous torrents of water across eastern Washington and down the Columbia River toward the Pacific Ocean. Floodwaters nearly 1,000 feet deep surged through the Columbia River Gorge and flooded the Willamette Valley. Flowing with 10 times the combined annual volume of all the Earth’s rivers, floodwaters raged at 60 miles per hour, stripping away up to 200 feet of topsoil and ripping huge boulders from the underlying bedrock. The floods also carried boulder-laden icebergs- as the ice melted and the floodwaters recede, boulders, called ‘glacial erratics,’ remained stranded in fields and prairies. 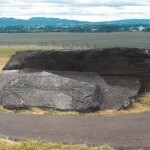 The boulder at the top of this trail is the largest known glacial erratic among the hundreds found in the Willamette Valley. This large glacial erratic, composed of a metamorphic rock called argillite, was once much larger! Geologists estimate that the boulder originally weighed about 160 tons- visitors have removed over 70 tons. 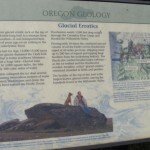 Please respect this vestige of Oregon’s remarkable geologic history- take photos only! Along with icebergs, the Missoula Floods carried vast amounts of gravel, sand , silt, and clay, which helped make the Willamette Valley one of the nation’s most fertile agricultural regions. The trail to the rock provides an excellent view of the surrounding vineyards. Enologists (wine scientists) credit soils created in the wake of the Missoula Floods with the success of Pinot Noir, Pinot Blanc, and Pinot Gris wine grapes in this region. Some 40,000 acres of these grapes thrive in the Willamette Valley and are used to produce highly-prized wines produced in the French Burgundy style.